Colleges and universities are institutions of higher education. The distinction between the two is not always clear in the United States. It can be said though, that most colleges focus on undergraduate studies, while universities offer both undergraduate and graduate level education. Furthermore, universities are research-oriented institutions while colleges are generally focused on education. Most colleges offer four-year programs culminating in a bachelor’s degree. Additionally, universities offer graduate programs that typically end in a master’s degree or doctoral degree. As noted above, these distinctions aren’t set in stone and there are colleges that carry the name university and vice versa. In the United States, there are private and public institutions of higher education. Public universities are administered at a state level and receive funding from the state government. Private institutions do not receive public funding and have to rely on endowments and student tuition to cover their ever-increasing costs. As a result, tuition at private colleges and universities is typically higher than at public institutions. In general, higher education in the United States is costly and many students have to rely on scholarships, student loans or grants in order to attend college or university. Even though the costs of education have steeply increased over the last 50 years, the percentage of the population with at least a college degree has never been higher than today. In 2015, 32.3 percent of the male population and 32.7 percent of the female population held at least a college degree. In 1959, this rate was at 10.3 and 6 percent for the male and female population respectively. College enrollment data reflects this trend as well. In 2014, almost 20 million Americans were enrolled in college, up from less than 6 millions in 1965. The United States is home to some of the most renowned universities in the world. Schools, such as Stanford, Harvard and Princeton, are frequently ranked among the best universities worldwide. The eight schools comprising the Ivy League (the Universities of Harvard, Princeton, Yale, Pennsylvania, Cornell, Columbia and Brown plus Dartmouth College) are especially known for academic excellence. An international business school ranking, based on average alumni salary, is dominated by U.S. schools, with 5 of the top 10 schools being located in the United States. The salary ranking is topped by the California-based Stanford University with an average alumni salary of 225,000 U.S. dollars per annum. 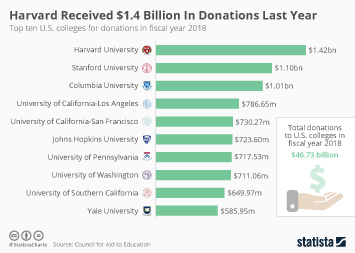 Earning a degree at an Ivy League school like Columbia University requires a considerable upfront investment however, with annual tuition and fees amounting to more than 55,000 U.S. dollars, according to this college ranking, based on annual student costs. Top 100 Companies: Education U.S.